Nanny Poppinz is A 27/43 Company - 27 Years Old and 43 Thousand Families!! If you are interested in a successful career as a Nanny while making a difference in the lives of Seattle area families, then Nanny Poppinz has the job for you! Since 1992, Nanny Poppinz has helped thousands of Nannies find jobs with families who appreciate true quality childcare. As the fastest growing Nanny referral agency in the Nation, Nanny Poppinz has referred the finest quality Nannies to over 43,000 families. In addition to part-time and full-time Nanny positions, Nanny Poppinz can also help you find temp jobs where a family pays in cash at the end of each day or evening. These jobs may be for short-term babysitting, caring for children while a family is staying at a hotel, or keeping children during after-school hours. Once you have worked successfully as a temp for one of our families, you will be a top contender for additional temp jobs as they become available. At Nanny Poppinz, we only refer the highest quality Nannies to families. That's why we personally interview our Nannies before sending them to meet a family. As a Nanny Poppinz Nanny, you will have relevant childcare experience, be legal to work and will have passed a detailed background and computer check. We also want to make sure that you have the necessary skills in the event of a childcare emergency. That is why we require each Nanny to be CPR, First Aid and AED trained. But at Nanny Poppinz, we don't pass the cost of training on to you. 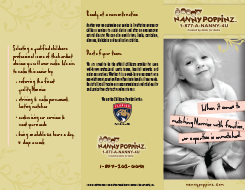 Nanny Poppinz cares about our Nannies and wants to help find a job that is perfectly suited for you. Let Nanny Poppinz help you find your perfect family match today! To get started, click on the 'Nannies Click Here' link to complete your application or call Nanny Poppinz for information. Additional Requirements:: Reason: Sick Parent Pets: Cat Parking: Yes Public Transportation: Yes Driving Required: No Vehicle Provided: No Family's Comments: Both parents have cold and cough, no fever. We are flexible about the time: it can start couple hours later and finish couple hours later, if that's the only available option. Additional Duties: Days might vary due to partner traveling schedule. Housekeeping Frequency: 1x per week. Additional Duties: Occasional errands with children. Additional Requirements:: We are looking for care when our kids may be contagious with a cold, flu, fever, or stomach bug. Getting set up for back up care.